Button mushrooms are my favourite. In India, I tried mushroom only once that too the big wild grown mushrooms, which tasted very good. Mushrooms are best eaten fresh otherwise it might cause some health issues(especially in restaurants, I don't order any mushroom dish). 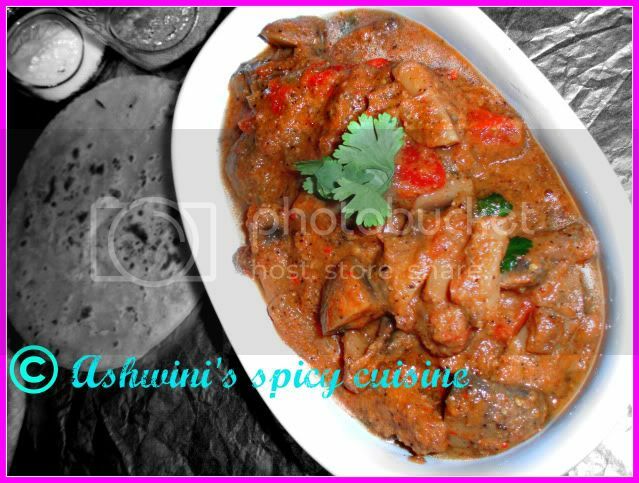 I was browsing vaishali's Holy cow blog, found this wonderful recipe from her dad. It was simple yet delicious. I didn't make any changes to recipe, except excluding potatoes. Check out Vaishali's Holy cow!!! Heat 1/2 tbsp of the oil in a skillet. Add the coriander, cumin, chillies. cardamom, cloves and peppercorns and roast until they start changing color and become fragrant. Remove and reserve.Heat another 1/2 tbsp of oil stir fry half the sliced onion, garlic and ginger until they are golden brown. Reserve.Without adding any more oil, roast the coconut shreds for just a few seconds until they start turning golden-brown. Remove immediately. Be vigilant because coconut can burn easily. Put the spices, onion, garlic, ginger and coconut in a blender and using 1/2 to 1 cup of water, grind to a smooth paste.In the same skillet used for toasting the spices and onions, heat the remaining 1 tbsp of oil.Add the remaining onion and cook until the onion starts turning golden-brown.Add the diced tomatoes and turmeric. Cook until the tomatoes start to break down.Add the sliced mushrooms and stir to coat with the spices. Add the potatoes.Cover and let cook until the veggies turn quite tender.Now add the ground spice-onion mixture. Stir thoroughly.Cover and let it cook another 10 minutes for the flavors to meld together. Vaishali, Ur recipe is TRIED, TASTED & CERTIFIED:EXCELLENT. Hi! It's a mushroom day today.. I have read a lot of mushroom recipes today. Great click with vaishali's recipe.Tempting.. Thanks Pari, Ann, sailaja and Ann.. This is one of my fav click!!! Looks awesome! This was the first dish I tried from Vaishali's blog and it turned out excellent. I blogged about it a long time back too! Looks nice and spicy... yeah and a great recipe too..considering that u used it with chicken, mushroom and next on the list is mutton. Wow looks so spicy and tasty. Nice click. Looks spicy & delicious, nice one. Hmm looks very spicy and tasty! Slurp! You are right! This mushroom gravy tasted heavenly! It is very easy to prepare too!! loved the dish! Lovely recipe...plate looks tempting to me.